I love to eat rice, as well as my husband. Since, I started to want to shift more to a whole grain or brown rice more often for our diet, I do sometimes use as a side dish or salad for us both. But still we love to eat white rice. I just realized I can not eliminate white rice from our diet completely, but we can eat a bit less. 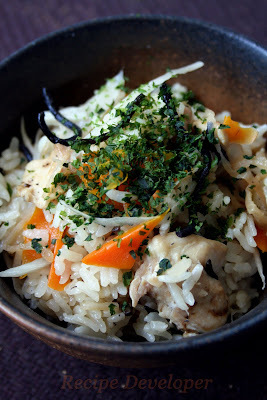 Instead of just a simple steamed (cooked) rice, I often make this rice. It's so easy to make because I can put any veggie, meat...aay ingredients I wish to use into the rice cooker together and press the start button. That's it. After 40min, it's all done and ready to eat. This is called "Takikomi-Gohan". Soy sauce, sake,(yes, sake!) and salt are usually used to make this dish and added to one's taste. And for the ingredients, Gobo(burdock root), carrots, shiitake mushroom, Abura-age(fried tofu), chicken, those are commonly used, but can vary at each house with a variety of ingredients which is used. It's like a Japanese style paella. For my version, I always add Hijiki Seaweed and Kiriboshi Daikon(Dried Shredded Daikon). Both great source for fiber and calcium. I would like to create a good alternative recipe with more of these great Japanese ingredients and introduce it western kitchens. Finally my cooking class is coming up in September, and I definitely will use these ingredients in the class, too.